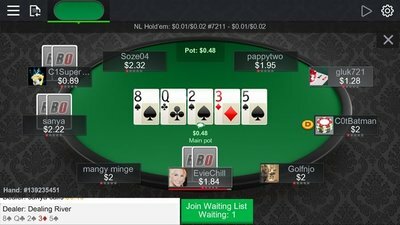 Real money poker players in the United States of America can now enjoy playing tournaments, Hold'em/Omaha ring games and Sit & Go's on their Android, iOS or Windows Phone tablets and smartphones. Available globally, including all 50 American states. BetOnline poker works on Android, iOS or Windows. Hold'em, Omaha and Omaha Hi/Lo Cash Games. 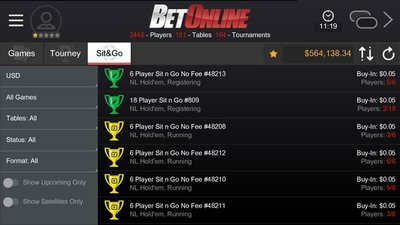 Mobile Sit N Go & Multi-Table Tournaments Available. Create "Private Tables" on your phone or tablet. BetOnline Mobile is also a sportsbook and casino. 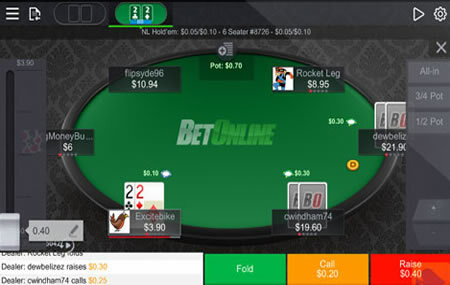 BetOnline is the latest major brand in the online gambling industry to introduce mobile poker for its players. And with their easy to use mobile poker software and promotions galore, BetOnline looks like a solid place to play poker from your mobile device because they accept players from every country in the world, including the United States of America. It is easy to get started playing mobile poker with BetOnline almost instantly. 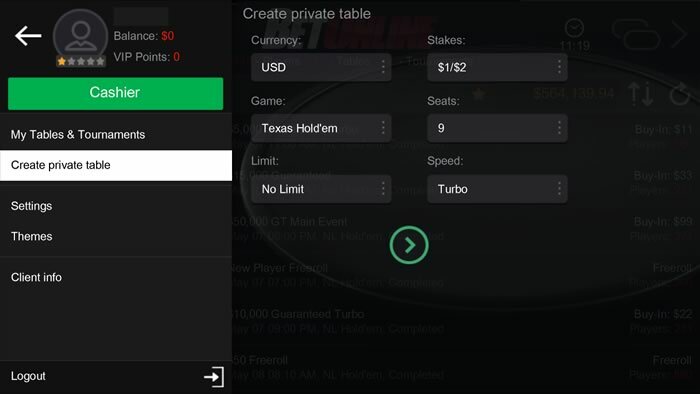 Android users can download the BetOnline Poker app, logging in with their BetOnline account within the app. There is no app available in the Apple App Store, so iPhone users do not have an app to download. They do, however, have the BetOnline mobile site, which lets them play poker right from mobile web browsers such as Chrome and Safari. With a number of promotions available, BetOnline makes it extremely enticing for new players to jump on board. They offer a 100% deposit bonus on a player's first deposit, as well as a $5,000 freeroll for new players. The combination of these two offers makes it possible for players to earn a large sum in their accounts without risking any of their initial deposit. For victims of bad beats, BetOnline has you in mind as well. Their Bad Beat Jackpot, at a minimum of $100,000 goes to a table in which a player loses a hand with four jacks or better. 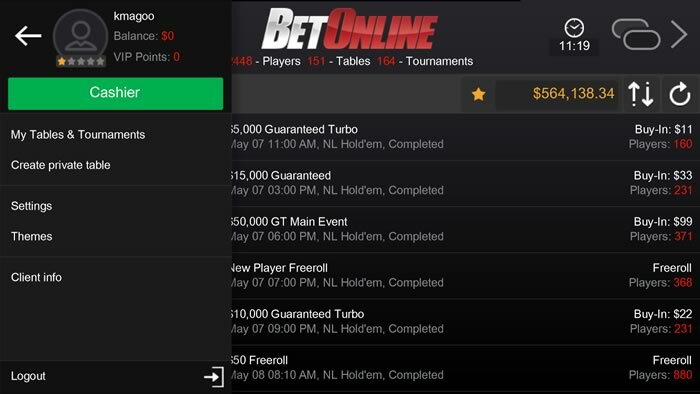 Once situated within the BetOnline mobile app or mobile site, it's time to play poker online. And once it's time to play poker online, you'd better like Hold 'Em or Omaha, or you're out of luck. BetOnline offers cash games, tournaments, and sit-and-gos in Hold 'Em. For Omaha and Omaha Hi-Lo, cash games are your only option. This is a rather limited selection of games, but playing those games goes smoothly, and it's better to be good at a limited number of games than to be unstable at a lot of them. BetOnline's features are strong, led by the ability to play at multiple tables at the same time. After choosing your first table, all you have to do is head to the lobby and select a second table. This prompts graphics in the lobby and at each table allowing players to switch from table to table with ease. So rather than having to grind out an increase in bankroll over an extended period of time, players can run it up in a hurry by winning at multiple tables at once. The mobile poker platform at BetOnline is well organized, which is perhaps the best feature that can be asked for on a mobile poker client. Sorting options include the ability to search for games based on the size of the blinds and buy-ins, as well as how many seats are available at each table. BetOnline's graphics are nothing to write home about, but that isn't necessarily a bad thing. 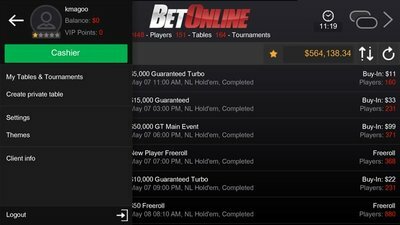 In a digital landscape where the temptation to create a flashy user experience exists, BetOnline instead went with a streamlined and basic approach to both their tables as well as their menus. There are only three different table felt color options and backgrounds, but they're not distracting, which is great for serious poker players. For funding your BetOnline account, the funding methods of a traditional poker site meet the futuristic funding methods of new age poker rooms. BetOnline accepts credit card transactions, bank wires, and other traditional ways of funding an account. But BetOnline also offers bitcoin and litecoin transactions, which are perfect for players who are restricted from doing so by their countries or banking institutions. BetOnline have produced a real money poker app that offers all the same games that you will find on their PC and Mac clients. Android users can either download the apk file or choose to play instantly from the browser of their table or phone. BetOnline also accept bitcoin, which makes banking easy for anyone living in the United States. They are also the only U.S. friendly poker room to currently offer poker tournaments on mobile devices.